The Daily Mail ran a story about this today. Charlie Hebdo was today facing legal action after publishing a series of allegedly racist and hateful cartoons mocking the death of Syrian toddler Aylan Kurdi. The drowned three-year-old toddler has become the symbol of the refugee crisis after haunting pictures appeared showing his body being carried off a Turkish beach last week. But the latest edition of the satirical French magazine depicts the dead Aylan lying face down in the sand under the caption ‘So Close to Goal’. Above him is an advertisement for McDonald’s reading: ‘Two children’s menus for the price of one’. Suddenly the pieces fell into place and I felt compelled to respond to the post. This is such a thoughtful and crucial analysis of white privilege (and entitlement) and the unquestioned right of media to publish dehumanizing views of those with little power – the scapegoats that deflect public attention away from the real causes of people’s increasing misery. As you rightly point out, France’s history in this regard bears careful scrutiny. As I read your eloquent arguments, I remembered a time when cartoonists were held accountable: http://law2.umkc.edu/faculty/projects/ftrials/nuremberg/NurembergStreicher.html. In one famous case, a cartoonist was found guilty of helping to create an environment in which atrocities like the holocaust could occur. Perhaps it’s time for Charlie Hebdo and their apologists to learn a little history? It’s no mystery why the mainstream media is filled with Trump’s hate speech and remains silent about Sander’s critique of social inequality. In this, the media, from my perspective, are complicit in setting the stage for hate crimes. And I’m reminded of a time not all that long ago when Julius Streicher played a similar role. Media have spread Trump’s hate-speech far and wide, catalyzing hate groups to attack and murder those they are led to believe are responsible for economic conditions orchestrated by the wealthy elite. Yet unlike many other other nations, the US doesn’t have specific laws that deal with hate speech. For what it’s worth, it’s time for me to share my concerns here and with my legislators and local (conservative) newspaper. It’s time to remember Pastor Martin Niemöller’s insights about the cost of silence. Carol, I’m not sure. The article doesn’t show all the cartoons so maybe there’s material there that is truly hateful, but it looks to me as though the cartoonists aren’t mocking the death of Aylan Kurdi but rather holding up to ridicule racist French and European attitudes towards children who are not Christian and European. It can, though, feel like exploitation and an invasion of privacy, and the use of a tragic event to make an ironic point with no concern for how the Kurdi family, other Syrian families, all other families might feel about it. But the little boy’s image has already been disseminated, deconstructed, and exploited. Maybe precisely because this is very sensitive and because it can be interpreted in different ways, Charlie Hebdo needed to exercise judgment. But obviously, that’s not in their repertoire. And yes, questionable content and imagery should always be called out to make people think critically. Thank you for your thoughtful reflections, Diane. Thanks for the perspective. I’ve been uncomfortable with the Hebdo affair, this helps make my discomfort clearer. Thank you for your comments, Vellissima. Thanks Carol for this. I am truly touched I have in some way inspired or provided the motivation for you to put these reflections on ‘paper’. I think your voice as well as the voices of others who care for humanity and the welfare of our planet is so needed. We have so much to learn from you and above all, we need the hope you help provide at this scary time in our history. Love and light and, thank you. Thank you for writing such a thought-provoking article and sharing it on your blog, G. Your analysis of white entitlement is so well-argued and provides an important foundation for addressing the issue of mainstream media compliance in intensifying fear during volatile times. I send thoughts of love and light to you as well. Reading Streicher’s hate speech it’s incredible to think that it was ever acceptable, just as, today, it is beyond belief that there is still so much ignorance and hate purveyed. I keep hoping that people who spout such vitriole are not given credence but history has proven otherwise. Some sections of the media seem to have abrogated any sense of journalistic honour and integrity. They do have a responsibility to report news but the way in which it is done leaves a lot to be desired. Ownership of the various media groups grants questionable practices. The Hebdo piece is sickening. Trump is sickening. I fear the appeal they have to some people and the hatred they incite. I was suprised that the US does not have specific legislation in place to deal with hate speech. The first link in your post isn’t working, ‘unknown error’, but the rest were fine. Thank you for speaking out. It is my fervent hope that we all do. Hate and ignorance breed fear, fear breeds more of the same. Those who purvey it as their stock in trade need called on it. 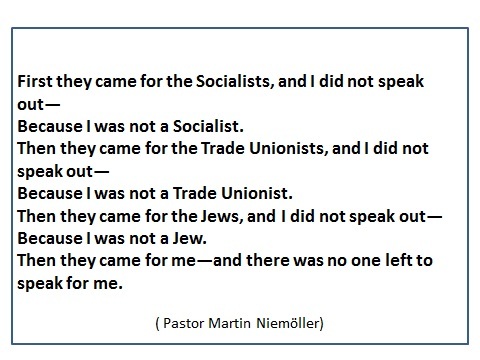 Niemoller’s words will always be true. Peace and love to you. An important insight to keep in mind these days, Sojourner. Thank you for sharing this. What you wrote brought this quote to mind. Satire continues to elude me. Just using images of that child’s dead body lacks sensibility. It eludes me, too. In this case, it’s unbelievably insensitive and potentially incendiary given growing fears over the refugee crisis in Europe. On another note, the term “white entitlement” misses the mark for me. Whites are not all in agreement or all in power. There are many “unentitled whites” even in Euro countries! I think a better term is “elite entitlement” with “elite” referring to the individuals in power/with wealth/with media influence in any given place. Of course, the people that own the media (the Murdochs et al.) are in the same league as the Exxons and the Monsantos of the world. So naturally they use their voice to shore up the weakening status quo, at any expense to the planet. (Read John Ralston Saul, ‘Voltaire’s Bastards’.) Not sure if Charlie Hebdo is an independent but it richly illustrates your point. An obsessive lust for fame, wealth or power seems to have voided some peoples’ consciences. Editorial cartoons are a time-honoured tradition with as much credibility as social satire as any other fine art. But like any creative power, it must be exercised in good conscience. I find I get much better, clearer information (with the propaganda filtered out and the research properly done) from media watchdog groups like Fairness and Accuracy in Reporting (FAIR0 who are well worth not only watching but supporting. globalresearch.ca has some pretty cutting edge analyses too. Your perspective as a journalist is especially important, Art. I appreciate your analysis of the need to exercise wise judgment in the choice of what to share, and your recommendations of good media watchdog sites. I think this is such a difficult one. Charlie Hebdo isn’t satire I like, but their target is actually the French right wing. Satire is really a difficult one, because the aim is to show the ugliness of Society, and in this case, the face of immigrants. Charlie Hebdo expresses the way that their satire is misunderstood. And yet, as Saadia from the Human Lens explained last year, many don’t understand satire, and people who feel marginalized are often truly offended by the work. At the same time, the goal of satire is to provoke dislike for the narratives or images presented, and to point out quite how unfair they are, so that dialogue can occur. And so all discussion on the images is helpful. Thanks for this information about perspectives on Charlie. I learned a lot today! Yes, everything is complicated; can one ever know enough to make a proper assessment of anything? 😦 I agree that we need to protect the right to freely think, express, and engage in dialogue, but shouldn’t it be possible or even the speaker/writer’s responsibility, to express diverse or even highly critical opinions without resorting to crudity and rudeness? (Polyanna here? 🙂 ) While “political correctness” is/was an attempt in the direction of respect, that pendulum has swung so far that it also undermines freedom of speech. Conundrums. I agree that the cartoons are crude….even disgusting. As the writer shares, Charlie Hebdo can make your stomach turn. And yet, I think the value of satire is to bring all that remains hidden to the fore, so that we see the ugliness of our social beliefs for what they are. It’s a (truly ugly) mirror which reflects society back to itself. Derrida speaks of the buried histories or stories in society which remain denied, repressed, or simply the elephant in the corner. We don’t like to face them, so we push them away and pretend we are polite. But these unaddressed ways of seeing the world, termed specters, haunt the present. How comfortable are we, speaking about the everyday racisms which haunt us? The ugliness towards refugees and refugee policies was shown in a documentary called Like a Man on Earth, which shows of an agreement upheld by Libya to keep Europe ‘white’. I sometimes think that exposing underlying social injustices is important, even if those injustices are nauseating. The image of the child, vulnerable and moving, was used by the media around the world to provoke sympathy. But the conversations on refugees as less than human, people who will only take from society, remain. Exposing them for their ugliness makes us recoil. Perhaps it should? I don’t think the images were (or are) always received as intended. I see Charlie Hebdo have a new aspect to their site, explaining a lot of the images, and what their intentions are. They do say that their have been a lot of accusations of racism. Many of the reports I’ve read on the shootings earlier in the year did comment on the ‘racism’ behind the cartoons as belonging to the cartoonists rather than the social. And they did cause offense. Although I don’t like Charlie Hebdo, I do appreciate other satire. I like the way it brings the hidden world into conversation, and the way it can be very incisive. I also think that the conversations we’re having because of the responses are really very helpful. If people feel outraged at the depiction of immigrants (I see nationality as the new means of expressing racism) then this can only help when working towards social justice. All conversation helps to bring transformation, and I think this one goes a little deeper than sentiment, which is quite wonderful. I guess the real work is to keep the conversation alive. I do agree that there are far more sensitive ways of doing that. It’s why I don’t like Charlie Hebdo very much. Thanks so much for engaging! This is actually in reply to Nicci’s Dec. 19 comment – then I’ll stop cluttering poor Carol’s blog post (thanks, Carol, for your indulgence!) Thanks, Nicci for your insights! 2) I disagree that “nationality is a new means of expressing racism.” This is a very old, equally hurtful form of expressing racism, within any race, evident whenever you read about history, or just look or listen around. I wish we would just recognize we’re all part of one Human Race, no matter what colour, nationality, specific ethnicity, or of what regional origin we are, and respect that. Evil and good are present in various degrees in all individuals throughout the human race, but that is an entirely different issue. Satire has a place in cultures that believe wit and demeaning humor are effective tools for social change. It’s not a tool I use often because my purposes for communication have usually been to focus on strengths, to promote respect for difference, and to encourage unity. I also tend to avoid elitist language in favor of simplicity and clarity. “Satire is a technique employed by writers to expose and criticize foolishness and corruption of an individual or a society by using humor, irony, exaggeration or ridicule. It intends to improve humanity by criticizing its follies and foibles. A writer in a satire uses fictional characters, which stand for real people, to expose and condemn their corruption. Satire – from my cultural perspective – shames, uplifting no one. Thank you for sharing your perspective, Nicci. I couldn’t agree more that there are limits one must exercise, the use of discretion should be honored. But I’m fearful of laws that censor what may easily be construed as hate speech on a whim, on the grounds of its ramifications of interpretations of speech not directly inciting violence. Who interprets, who judges, what constitutes hate speech. “In law, hate speech is any speech, gesture or conduct, writing, or display which is forbidden because it may incite violence or prejudicial action against or by a protected individual or group, *or* because it disparages or intimidates a protected individual or group.” There is potential in those words to implicate those simply voicing opinions, as we ourselves do. And to trust this corrupt nepotistic authority in its fair and just implementation is I fear suicidal. If I were to say in regards to religious fanaticism, God is part of the problem and not a part of the solution. A religious fanatic, or even not a fanatic, might take that as a “disparaging” remark (in fact I believe it is), and then used as vendetta. And with the right connections, I’m done. And I say here, we don’t need more authoritarian laws, more laws just lead us down a darkened alleyway, but rather we need more understanding, more tolerance. This, a disparaging remark against Authority’s authority. “There is potential in those words to implicate those simply voicing opinions, as we ourselves do. And to trust this corrupt nepotistic authority in its fair and just implementation is I fear suicidal” – I am finding this to be a valid and increasing concern these days, even while I am deploring hateful words and actions We need more wisdom, respect, and discernment in this world. That is a shocking cartoon. Outrageous, really and I understand it is typical for that publication. I suspect regulation wouldn’t be all that effective — possibly just driving the hatred underground where it will gather resentment and get stronger. I see this kind of thing as a public health issue. There was a time when everyone smoked. When using seat belts was seen as kind of ridiculous. Both those issues were addressed through helping people re-frame their own thinking about it. I joke but really it is kind of true that a lot of people need to go back to the lessons we were supposed to learn in kindergarten: that sharing is a good thing and that we should try to solve our problems with words instead of hands and feet. I look forward to the day when the vast majority of people can look at a magazine like Charlie Hebdo or a person like Donald Trump and just turn away in disgust. Bravo for speaking out, Carol. We’re very strongly pre-conditioned in industrial society not to speak out. Excellent post. I just pressed it. Thank you for your kind comments, Kristin, and for sharing this post. I love the work you are doing with your community to welcome refugees. It’s so hopeful and inspiring!